Sometimes I look at the toys in my girls' play room and wonder if they would notice if half of them disappeared. They're fun and all, but some of them just seem to end up sitting on the shelf or only getting played with once in a while. 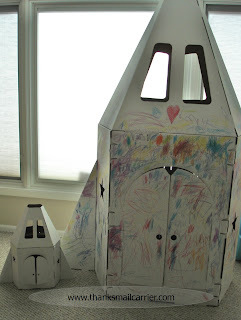 On the other hand, I wouldn't dare touch the Shuttle Imagination Playhouse that has had a permanent place in our home ever since our Crafty Kids (formerly KidsCraft) review back in June. There is hardly a day that goes by that my children don't play in there, turning it into everything from a house to a rocket to a bus to just a fun place to hang out and play. Except maybe give it a friend. After receiving a tremendously positive response to their Shuttle Imagination and Creation Cottage, Crafty Kids has now come out with model versions that are 1/3 the size. Still featuring the same easy-to-assemble, high quality, detailed 100% recycled blank cardboard pieces as their full-size counterparts, the Mini Craft Models are just the right size for dolls or stuffed animals. Plus, they're just so darn cute, you know? What is it about things being small that just makes me want to say, "Awwwwww"? Already familiar with the ease of putting together the slots and flaps of Crafty Kids products, this Shuttle Imagination Craft Model was fully constructed and ready to be decorated in a matter of minutes, if that. I definitely didn't have to tell Big Sister E and Little Sister B twice, they went right to work at personalizing this as their own. Weighing in at only three pounds and standing just under two feet tall, this Shuttle can easily be moved from the floor to the tabletop without any problem and I love the way that my kids can easily customize it at their own pace. If they feel like pulling out the crayons or markers (each Craft Model actually comes with its own set of six washable, non-toxic, jumbo markers) then they can, but if they just want to whittle away the hours sending their stuffed animals and baby dolls on imaginative adventures, then they can do that as well. With their full and mini-sized exceptional Playhouses, Crafty Kids has turned a universally-adored toy (the cardboard box) into an award-winning, creativity-inspiring product. Whether two feet tall or six feet tall, the Shuttle Imagination and Creation Cottage combine great design, quality construction and imaginary play into an inventive, eco-friendly pleasure for kids of all ages. One lucky person will win their choice of a Shuttle Imagination Craft Model (ARV $24.95) or Creation Cottage Craft Model (ARV $22.95)! To enter to win: Visit Crafty Kids and tell me another of the great products that they sell. 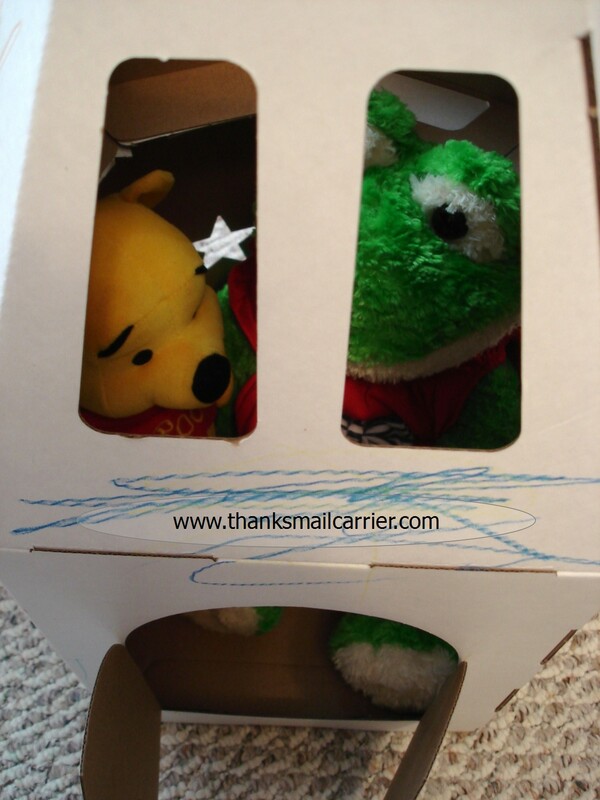 3 Extra Entries if you blog about this giveaway linking back to Thanks, Mail Carrier and Crafty Kids. Please leave an address where it can be found. 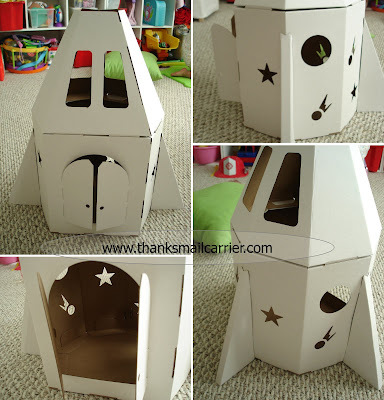 A big thank you to Crafty Kids for providing a Shuttle Imagination Craft Model for me to review as well as the choice of Craft Model for one lucky giveaway winner. The opinions shared are my own and honest if you really need to see more, click here to see how I roll. I like the Eco Star 8 Pack Basic Colors + 2 Bonus Shooting Stars . i like the Shuttle Imagination Craft Model also. I like the Creation Cottage! They also sell shooting star crayons. I entered the Spinning Seesaw giveaway. I like their Eco Star 8 Pack Basic Colors + 2 Bonus Shooting Stars! I wrote on Crafty Kids wall! Hey! I'm new on the Blog Hop! Just wanted to let you know that I'm following you now! Check out mine? I like the Easy shake Glob paint. Wow - these look fun... when my girls were little we just used boxes from the furniture store! I think the Shuttle Imagination is cute too. Following on GFC as Me as Mom. I like the GLOB easy shake jar! I had one of the full sized shuttle imaginations when I was little! I would love to have one for my kids! I like the GLOB Paint Kit. What a cute idea!! Great pics too! MANDATORY ENTRY: Another GREAT product Crafty Kids carries is the "GLOB Easy Shake Jars." These GLOB jars are pretty cool! I wouldn't mind owning the set. The Glob paints look great as well! They also carry crayons and paints to decorate the playhouses with!! My nephew had one of these in his classroom and they all LOVED it!! Entered your other contests... Play Doh and Halo Sleep Sack, plus others!!! The GLOB Easy Shake Jars would be great as well. Entered Clouds and star giveaway!